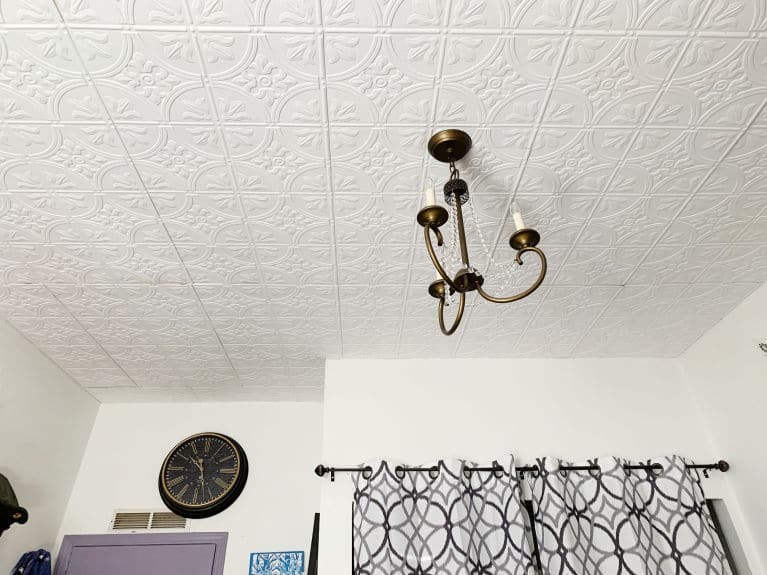 Learn how to install ceiling tiles and give your home the makeover you didn’t know it needed. 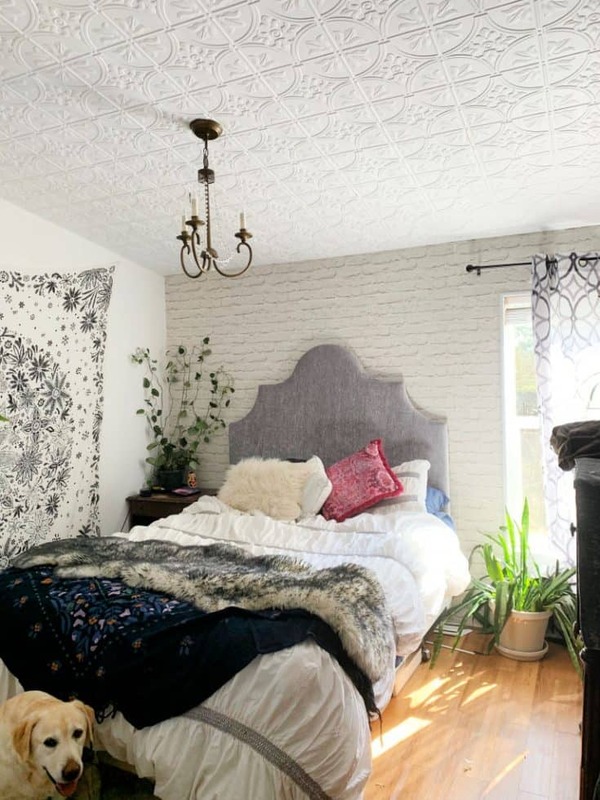 These ceiling tiles instantly upgrade your home and give you a luxe look on a budget. Use the following steps to install ceiling tiles in just a few hours. Thank you to Fasade for supplying materials for this project. 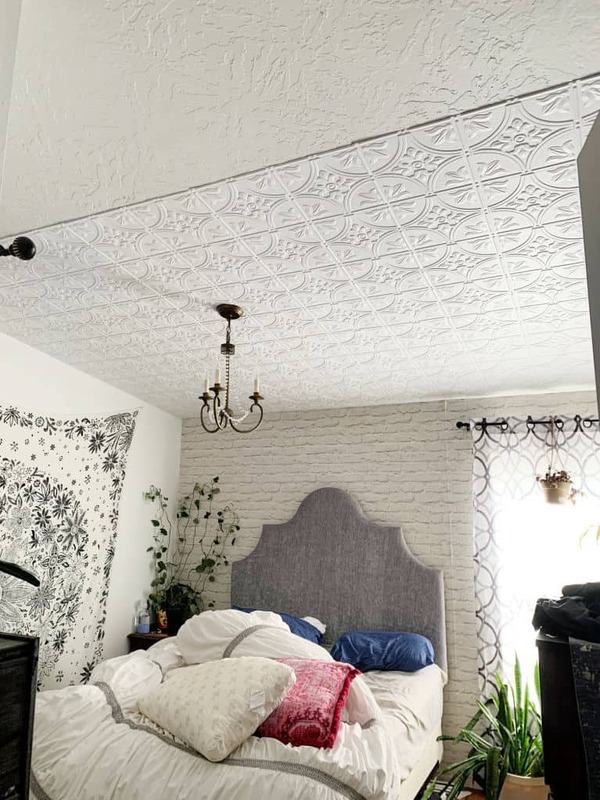 I recently upgraded the ceiling in my bedroom and today I’m sharing the before and after pics as well as showing you how easy it is to install ceiling tiles. The ceiling in your house is one of the places that you really don’t think about when it comes to comes to home improvement projects. By using a product like Fasade Celing Tiles you can totally upgrade the whole look and feel of a room in your home in just a few hours. What kind of glue do you use for the ceiling tiles? 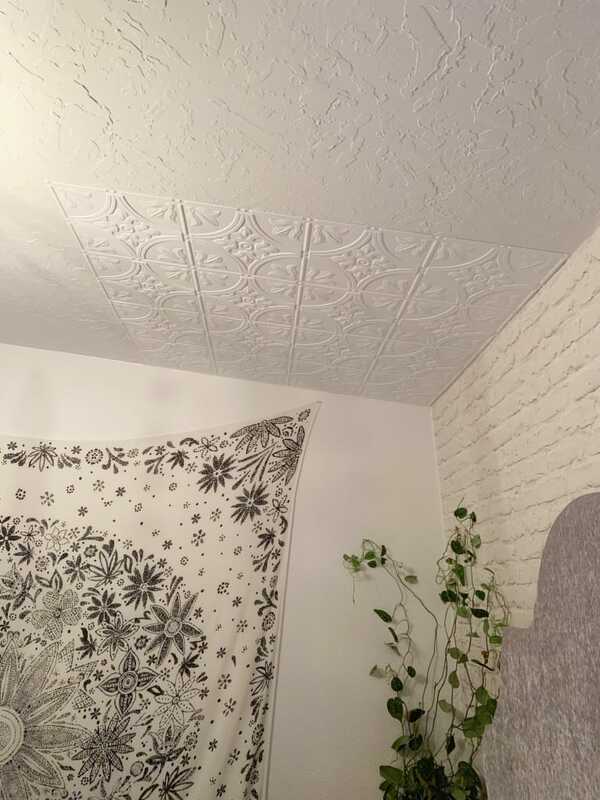 Before I started, the ceiling in my bedroom had a pattern stamped into the drywall which looked fine but wasn’t really my style. Like most humans, I spend a lot of time in bed and that means a lot of time looking up at the ceiling. Why not make your ceiling look beautiful since it’s the first thing you see in the morning and the last thing you see before bed? I decided to try Fasade ceiling tiles and I am so happy that I did. 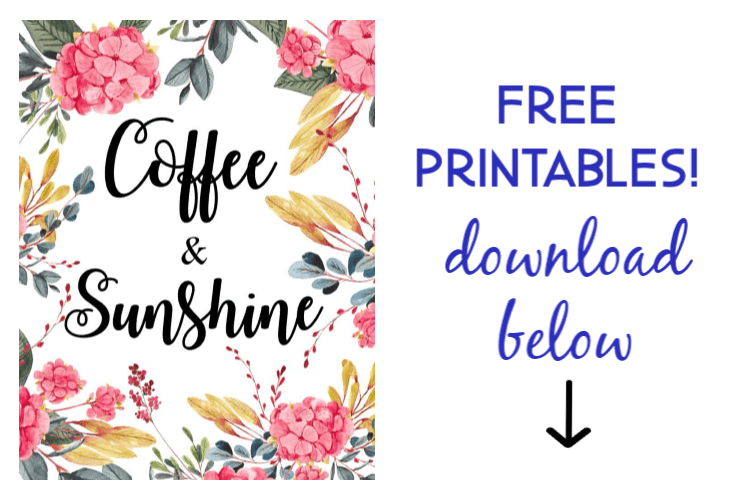 My husband and I worked on this project in one afternoon and the results are amazing. I’ve worked with Fasade in the past on my faux tin kitchen backsplash project and 3 years later my backsplash still looks as good as the day I installed it. I contacted them to see if they would be interested in working with me on this ceiling project and they graciously sent over some ceiling panels for me to try. These tiles are very thin- but super durable plastic. I opted for the Fasade Ceiling Tile -2×4 Direct Apply-Traditional 2 in Matte White style. You can purchase Fasade products from DIY Decor Store. They come in 2×2 or 2×4 sized sheets and they simply glue up to the ceiling. They can also be laid into any standard 15/16” grid system. I used the online calculator to determine how many tiles I needed and then placed my order. You need to make sure your ceiling is clean. You may want to apply a fresh coat of primer or paint on the ceiling before you install the panels. Wipe the back of each panel with some rubbing alcohol. This will remove any the finger prints, dust or dirt to ensure maximum adhesion to the ceiling. Any damaged, loose or uneven areas must be repaired, patched, leveled and primed. Fill cracks and irregularities with wallboard compound or spackling, then sand smooth with fine-grade sandpaper. Next, apply the glue to the back of the panel using a caulking gun. 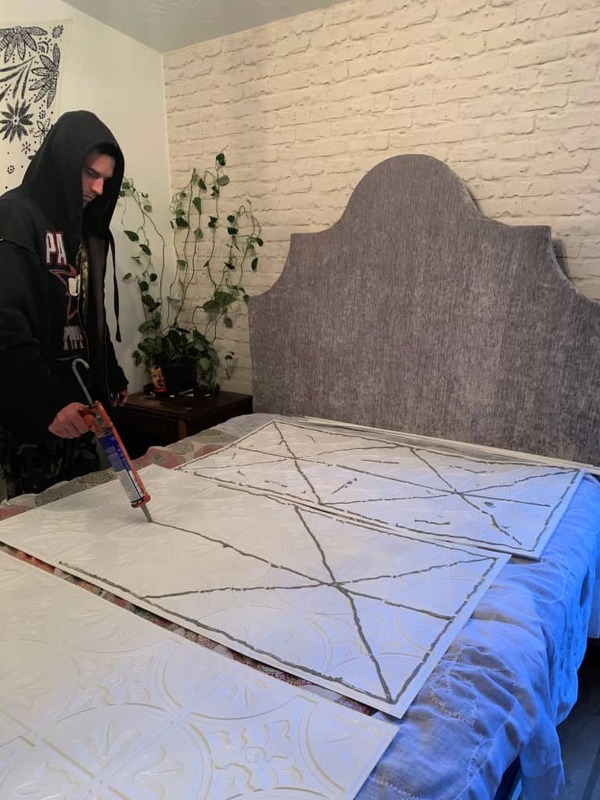 We cleared out the bedroom and put a drop cloth on the bed before applying the adhesive with a caulking gun. The preferred method for installing Glue-Up ceiling panels is to apply the adhesive directly to the back of the panels. Then use use a notched trowel (1/4″ x 1/4″ x 3/4″) and spread the adhesive evenly on the panel. 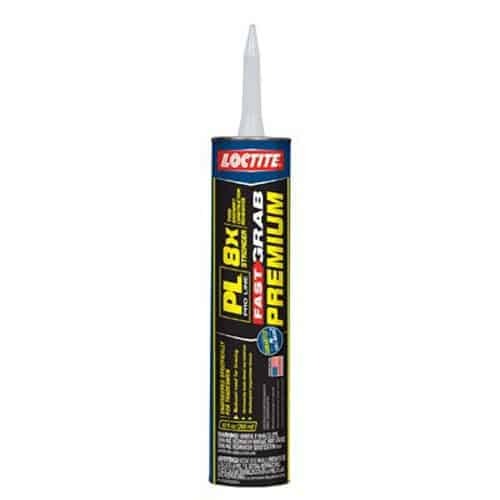 ACP, the manufacturer of Fasade recommends using Loctite PL Premium adhesive. Do not use double-sided tape to install ceiling panels. I used regular craft scissors. The panels cut very easily. Start in one corner and glue up the panels left to right. Work your way across the ceiling and over. Trim the tiles to fit as you go. I will admit I was nervous the first night after we installed the ceiling tiles that they would fall down on us in the middle of the night. I’m happy to report that they stayed up just fine and are very secure. Measure ceiling and order supplies. Order 10% more than you need to account for mistakes and areas that need to be trimmed. Use a caulking gun to apply adhesive to the back of the panel. Press the panel to the ceiling and smooth it down. Trim panels if necessary to fit and overlap at the edges for a seamless application. After an hour apply pressure again to ensure strong adhesion. What do you think of my ceiling tiles? Would you try this in your home? Make sure you check out DIY Decor Store for more home ceiling and backsplash inspiration. I love how it looks! Did a great job! But I have popcorn ceiling & don’t think it would work for me. I’d love to get rid of it!! I am definitely gonna try this. My problem is how do you go around the ceiling fan?. I guess I can unscrew it. Is that what y’all did? I loosened it and then I cut a slit in the side of the panel and slid it into place. If you can take it down completely and then put it back up I would recommend that! 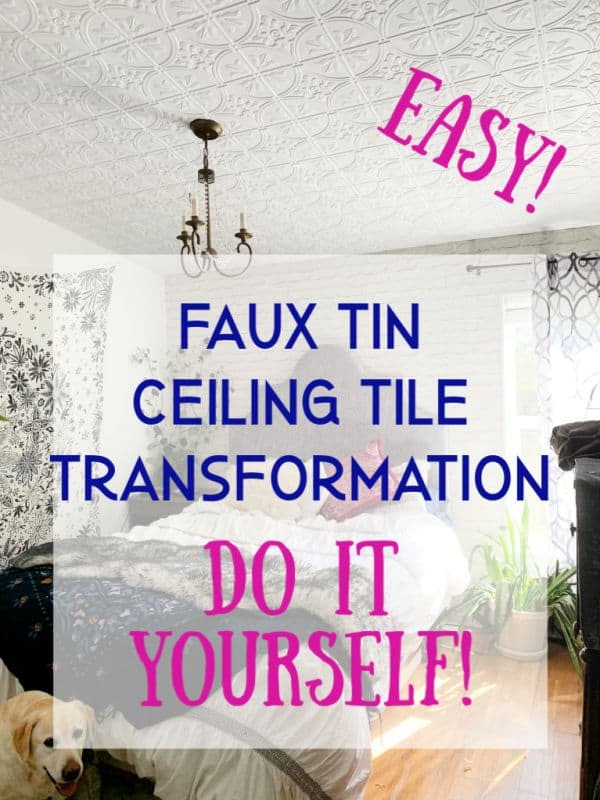 I was planning on installing faux tin ceiling tiles in my kitchen. The substrate I have put up is particle board. will this work? do I have to prime this? I believe particle board is fine. I would check with Fasade to make sure though. As a director of digital marketing, I’m confused whether you’re trying to educate your audience or provide a post so chalk full of advertisements that the user experience becomes secondary. I certainly will not become a subscriber or click on any of your content from hometalk in the future. 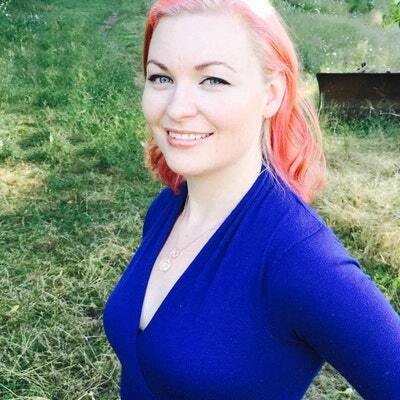 As a director of digital marketing you should know that bloggers make money from ads. 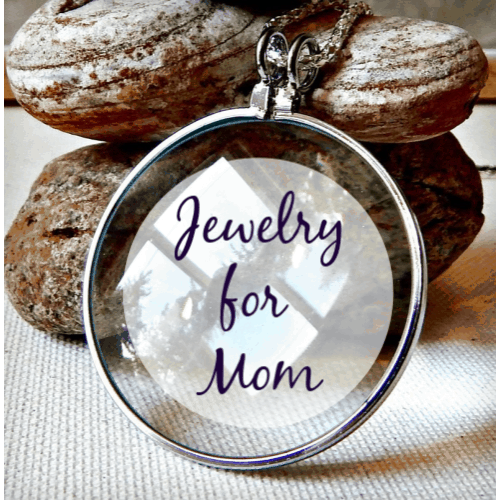 No ads=no blog. Please don’t comment on my website again. Have a good day.